Could GM modified Salmon cause chronic illnesses? 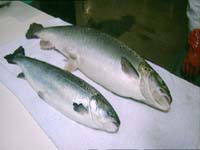 We already eat GM crops and now GM Salmon, which grow faster and larger than ordinary salmon, are soon to come onto the market. But does anyone know what effect they will have on us and our environment? This fascinating documentary follows the few independent researchers of genetic engineering as they investigate the dangers of "Monster Salmon". "At eighteen months old you see the enormous difference here ... the salmon as it exists now is not profitable enough", says Andrew Kimbrell as he examines an enormous transgenic Salmon. It dwarfs its natural brother lying alongside it. His is one of the few voices questioning the fast-tracking of GM Salmon onto the marketplace. While giant salmon are about to land in our pots and frying pans, independent scientists are only now starting to examine the science behind it. It's a game of catch up and the early indications are worrying. "Certainly if DNA was not cleared from the organisms, if that happens, then it may be the start of a highly unwanted process with regard to health". While researchers questions are ignored, humans are about to become guinea pigs for genetically engineered fish. There are worries that eating transgenic Salmon could weaken the immune system causing chronic illness, infertility, and even disrupt our own DNA. Yet these seem risks the pro-GM scientific community seems willing to take. However, it is not just the impact these Salmon could have on humans which is worrying scientists. There are suggestions transgenic Salmon could lead to the extinction of Salmon in the wild. While Aqua Bounty, the company looking to market transgenic Salmon, claims the salmon will be sterile and unable to mate, scientists are contesting that their fertility will be impossible to regulate. If fertile transgenic Salmon escape to the wild the consequences will be dire. "One thing we have found is that the young don't survive as well ... it is quite likely the population could go extinct". "What could be more important than deciding on the permanent genetic future of life on Earth, but we don't vote on that". While the questions over these Salmon remain, they will shortly be arriving on our plates and we won't be able to do anything about it. We won't even be able to tell when we're eating it. BERTRAM VERHAAG founded DENKmal-Film Production with Claus Strigel. Collaborating as producers, authors and directors, they have produced more than 90 films for cinema and television. 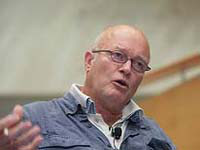 Bertraam Verhaag started making films about GM because he disagreed with the way multinationals were ignoring peoples interest in health and the environment. He felt a duty as a filmmaker to draw attention to their undemocratic modus operandi as they decide for us what direction science, democracy, politics, and even food will move in. 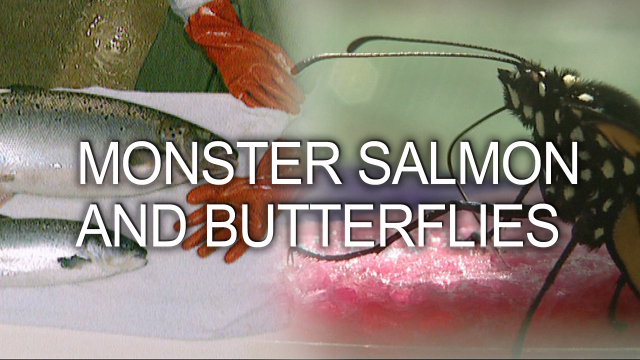 Monster Salmon and Butterflies is just one product of this ideal, which include: David Vs Monsanto, Designer Babies and Gene Robbery, and Vandana Shiva: Seeds and Seed Multinationals. On discovering Aqua Bountys decision to develop a GM Salmon Verhaag, fascinated with the lack of public awareness, decided to investigate. What he found was a lack of any public independent research. This film is the chronicle of the few disparate scientists who are fighting for our health and freedom to decide.